Street Photography Tips, On a Travel Blog? Yomadic is a site primarily about travel, not street photography. However, as travellers, we have the perfect opportunity to showcase a city. A series of photos creating an unknown story about the people who, after-all, are what really makes a city special, can make for a compelling and unique perspective on travelling through a foreign land. Photo Series : 24 Hours on The Streets of Hong Kong, by Nate Robert. They say you can smell the city in a good series of street photographs. “Travel” street photography can be artistic and informative, giving the viewer a genuine insight to a destination or location. Great street photography taps deep into the human condition. At it’s best, street photography piques your emotions and curiosity. You may even find yourself caring about the strangers portrayed in good street photos. But, frankly, street photography is one of the most difficult types of photography to do well. How do you make a seemingly “normal” and non-remarkable street-scene, interesting? How do you get the confidence to take photos of strangers? There are also other concerns, such as the “right” to take photos of strangers without their permission. I’m a relative beginner with this type of photography. Sure, I may be able to take a nice sunrise photo at Borobudur, or get a memorable image of an abandoned Cambodian jungle temple. But street photography – as a means of showcasing travel destinations – has a whole new set of considerations. …if you do, or if you have taken a series of street photos featuring a certain location in your travels, I’m happy for you to link to your work in the comments. 1. Just take the photo. It can be more than a little intimidating, taking photos of complete strangers in public. The reality is, most of the time, people really just don’t mind. Many are flattered. You might be surprised how many smiles you put on the faces of your strangers. Just take the photo! Don’t be sneaky. Don’t hide. But, when it feels right, don’t hesitate – take the photo. That “decisive moment” will come and go, very quickly. 2. Interact, and capture the interaction. There is something special about an image where you can see the subject engaging with the photographer. Capture that interaction, whether it’s a smile, or a scowl. When you can feel interaction in a photo, natural human curiosity takes over. What happened next? Was he pissed off? Why is she smiling in that way? Interact, and talk, with your subjects. More than once I’ve made a new best friend whilst out taking street photos. If somebody asks “why did you take a photo of me?” I’m honest and direct with my response. This has led to strangers actually thank me for taking their photos. As a traveller, street photography is a fast-track to meeting locals, and getting local advice. 3. Daytime is easier than night. There’s a rich street photography history of producing some very dramatic images using a flash, and at night. I don’t want to discourage anyone, but perhaps consider getting some experience during the day, before you move onto night shots. As with all photography, the biggest factor is light. Street shots at night can look spectacular, but the use of a flash is a level above in difficulty. he reality is, daytime is easier. Shooting during the day, it’s likely that you will get more “keepers”, and this will encourage you to go back for more. At night, you’ll often need the use of a flash. Keep in mind, you are taking photos of strangers. Do you feel comfortable firing your flash at strangers, often at close range? Not to mention, the reality of life in many large cities, is that day time is safer. 4. Work on a Street Photography Project. A project, or a “photo essay” will serve multiple purposes. It can take the viewer on a virtual journey of a city, or highlight a certain societal aspect. Also, it will keep you motivated to shoot more photos, and really, that’s the best way we all get better at street photography. As a traveller, finding a theme is easy. “Business-Men of Tokyo”. “Tourists in New York”. “Flea Markets in Penang”. Go for a walk around the neighbourhood your hotel is in, and capture what you see. Whether you’re in the thick of a metropolis, or hangin’ in the ‘burbs, you can create an interesting photo series, right on the front doorstep. Although a single image can have an enormous impact, a series of images can tell a whole story. Also, it gives you a chance to “curate” your own work, and choose about which images will/won’t make it into the final cut. 5. There are no rules to Street Photography. Really, no rules. There may be guidelines, but I suspect even many of those are quite flexible. Find your own style, shoot your own way, choose your own subjects. Exposure, focus, sharpness, these are just technicalities. With street photography, it’s all about the end result – the image – and not how the image was created. You don’t have to use a certain camera. You can use film or digital, black and white or colour. You can take photos of whoever you choose to take photos of, in whatever surroundings and locations that you choose. Your photos can be candid, or they can be posed street portraits. In fact, you don’t even need people in your photos, to make it “street photography”. I would say the location should probably be the streets. In public. But even that isn’t a rule. None of the street photography tips in this article should be considered “rules”. 6. And, the Most Important Street Photography Tip – Have fun. This is the key street photography tip. Have fun with it. Talk to people, take in the sights, slow down, and take a look around. When you’re travelling, street photography should be a completely enjoyable experience. Don’t take this too seriously, treat it as any other form of photography – capturing images of what you get a kick out of seeing, and having fun while you’re at it. As a traveller, I wanted to give you a feel for the people and the streets of Hong Kong. The Hong Kong hustle. This series of photos were all taken last month, during a 24 hour period. I wanted this series to feel raw, authentic, and honest, and smell like roast pork. These are great tips! Especially not hesitating – I can’t tell you how many great shots I’ve missed because of that. Now I set my shutter to continuous and just go for it, deleting later. I always love your street photography. You always say the nicest things, Andrea. I’ve done the same – missed shots due to hesitation. Although when I’m using my old film camera (as with the shots above), I can’t just use continuous shutter, so I have trained myself not to hesitate. One of the big advantages to digital is that you can take a lot of shots, and delete later. Purists may scoff at that technique – but I don’t – I say: use all of the tools and methods at your disposal to get the image you are chasing. Brilliant photos and great tips. I need to get the balls stick my camera in the faces of more strangers. Cheers Paul. You already have the camera skills, I’d be really interested to see what you come up with on the streets. While some of the photos you have posted in this article are exceptionally good examples of what ‘Street Photography’ is, there are others that have nothing to do with this genre, for example the wide photographs of car traffic (these are definitely good travel photos or urban landscape photos). Also, your tip #2 is inappropriate and does not belong to the Street Photography genre or the tradition that has been handed to us by the master photographers that defined its form. Street Photography is neither portraiture nor documentary though it may at times resemble those genres. One of the first tenets of Street Photography is that it is a form of candid photography, where candid specifically means the subject is unaware of being photographed at the very moment of capture and is therefore represented in a natural ‘situation’. making street photographs but it has been mis-used widely to mean ‘anything goes’. Having said that, I must add that I enjoyed your images (whether or not I consider them Street Photography) and I would encourage you to continue exploring this genre but please do it responsibly, we all have a responsibility to the tradition. I should also say that exploring a city through street photography is an excellent idea but since Street Photography is entirely subjective, it should not be confused for object photo-reportage through which insight is gained about the city itself. Evangelo, I appreciate you taking the time to respond, and thank you for the compliments. Thanks for pointing out that the urban-landscape photo is not street photography. I chose to include that particular photo, to complete the theme of “travel” street photography, and agree that it is not representative of street photography. At this point, given the likely audience on this website, I’m going to choose to leave it as part of the series. I respectfully disagree with you stating that rule #2 is inappropriate. But, perhaps I should have been clearer on this point. There is candid interaction to be captured between subjects, whilst the subjects remain unaware of the photographer. There are various types of interaction : between photographer and subject, between subjects, between subjects and the environment. My point being, to capture interaction in general. It is interesting that you mention the master photographers that have defined this form. By observing the photographs of masters such as Bruce Gilden, it is clear that the subjects are *very* aware of his presence. There are other examples of this, but my point is, this is not a *rule*, I have seen many non-candid street photos from the masters. So, I will have to disagree with you on that point. I remain flexible in my opinion, and perhaps it may change in the future as I gain more knowledge and experience. Again, thanks so much for your encouragement, and as I do have such a love for this genre, I will be sure to be responsible in my future exploration and practice of street photography. Your comments are very well thought out, and passionate, and I respect that. Now, I will need to spend a little time thinking about photo reportage vs documentary vs street portrait vs candid, and how they all piece together in my own body of work. Evangelo. I just clicked on your name and had a look at your site where you have photos for sale. Do you honestly think that a bunch of photos depicting people from the back is good street photography? No wonder they were not aware of your presence. And yet you have the audacity to criticize other peoples photography like you were some sort of authority? May I suggest you do two things Evangelo. Shove your massive ego where the sun does not shine, and get a life. I am so glad I stumbled across this today. I like all the tips you provided and I really love the black & white photos. I never think about making my photos black and white and just may have to start giving that a try. Glad you got something out of it Jaime. Nate, your photos have such life in them. They are fantastic. I have to disagree with Evangelo – I think definitions terms, or street photography in this case, are subjective. Words, practises, genres all have different meanings for different people. We don’t interpret them in the same way, and we shouldn’t – It’s what makes us grow people and how humanity evolves overtime. Thanks Cristina, thats a really nice thing to say! Evangelo is coming from a different perspective and background. I have communicated with him via email a couple more times. He is extremely passionate, and well experienced in this genre of photography. But, when it comes down to it, I agree with you. All of us think differently, and that’s what makes the world a better place. Whether or not our photos meet the specific criteria, or not (according to some people), it doesn’t matter, there are more important things in life. What is important, is that we all just do our own thing, and explore our own ideas. I’m a huge fan of breaking the rules!! Have to agree that you can make your own rules in street photography and people can get bogged down. Street photography doesn’t have to have people and it doesn’t even have to be on the street. Like the series idea. I found myself wandering around at 8.30an in HK for my last morn before getting bus to airport at 10am and noticed lots of workman fixing those illuminated displays that HK is so famous for so thought I’d do a series then and there. After a while they got used to me walking up and down the same stretch with my camera and a few were even a bit annoyed that I hadn’t taken pics of them! Hey Iesha! Your Hong Kong story sounds like fun. It’s amazing how quickly people go from “no photos!” to “why aren’t you taking a photo of me!”, when they start to realise your intentions are good, and you’re just trying to capture life on the streets. But seriously – that’s an amazing idea for a series, those illuminated signs are one of the best things about HK, so as a series, I think you’re onto something! Hi, thanks for the effort in doing something you are not used to. If you don’t mind an advise, never mix black and white with colour in a series or a reportage. It is very confusing to the eye of the reader because they are formats too different of expressing things. I assume you shoot in digital, so all the photos will be in colour. If you find a mini series between what you have shot and you think they express better in BW, convert them and post them apart in a separate series. Hi Luisa, every photo on this page was taken with a film camera. I never convert anything from colour to B&W, I don’t see the point. And, I often mix colour and B&W on the same page. Thanks for your comments, but I’ll have to stand my ground on this one. I started “playing around” for lack of a better phrase of taking street photos. I agree daytime is best. I think capturing people going about their everyday routines makes great photos and showcases the area you are traveling to. I plan on doing more and more of these types of photos, I still like the “brochure cover” photos but people are more interesting. Yes, I enjoy the “brochure cover” photos as well. I find myself often taking photos of landscapes (whether urban, or natural), as well as the typical “sights” of a city (and the odd tourist attraction…) But, I totally agree – people photos are so interesting to me as well. I reckon it’s just human nature, we’re quite a voyeuristic bunch when it comes down to it. Cheers Scarlett – I agree, it really shows a unique and honest perspective of a location (not that I have anything against “standard touristy shots!”). I love everyday life travel photos. I spend most of my time people-watching anyway so taking photos for me would just be a way of making these moments more intense. However I always struggle with the etiquette in these situations. Outside of Europe and western countries people can be a bit funny about having their picture taken. I would hate to offend anyone so I end up just not taking the photos I long to take. Sorry, but I have to strongly disagree with this remark. If you run a marathon, but you used a motorcycle, the result is that you “did” the 42 km, but everyone would agree that you missed the essence of running a marathon. If you climbed a mountain by letting you drop on the top by a helicopter, the result is that you arrived at the top, but again, everyone would agree that you missed the essence of climbing a mountain. If you go to a concert of classical music and they are playing the music by means of a CD-player while the “musicians” are acting, the result is that you would have heard the music that you came for and “seen the actors playing”, but people would agree that they would have missed the essence of a classical concert. If you stage a streetscene or you let people pose, the result can exactly look like a streetphoto and you can fool people with it, but it the end, you, the photographer, missed the essence of streetphotography. In my idea, the way to the result is just as important than the result itself. If you want to do the 42 km by motorcycle, please do, but don’t call it “running a marathon”. If you want people to pose on the streets, please do, but call it a portrait. If you want to stage a streetscene, again, please do, but do not call it streetphotography. Great tips, especially #2 and how you’ve made friends by taking photos of people. I’m afraid of taking frontal photos of people so I tend to avoid them as solo subjects and I always regret it! It is good to know people have responded to you with curiosity and helpfulness rather than being annoyed, as I fear. I’ll remember that next time I’m faced with a person who I’d like to photograph and use that as a way to introduce myself. That was a nice article…. well written and full of great tips. I have been shooting various street photos in and around London for a while now. I try to get as close as I can to people when possible. Other times I like to capture the surroundings of the subjects, as I think the background is also important (in my humble opinion). Sometimes the street and the surrounding architecture helps to tell the story. I hate all those rules. Leave the rules for landscape and still life photographers. The only rule for me is don’t upset anyone. I get a real kick out of capturing real people going about their business. Its almost like a sport. The results can vary, and sometimes I end up deleting a fair percentage of images as they don’t grab me later on, or I might have missed the action. I tend to use a small inconspicuous camera (Ricoh GRD3), with a fixed lens and nice wide angle. Its stealthy and fast. People don’t get so tense about a small camera compared to having a DSLR and lens aimed at them. Wuite often I take shots of people from arms reach… right up close. They still don’t know I got them. Thanks for a great article. I’m gonna follow your blog too. Good one Nate! I enjoyed this post & love the photo of the lady shirking the camera LOL. I enjoyed the tips too, esp #4. Sometimes, I have difficulty with coming up with ideas to inspire me but that tip really helped. I’ll keep it in my travel pocket! Thanks Christine…yes, she is definitely shirking the camera! I’m just not quick enough ;) Glad I have inspired you to take some more photos, you already have a great collection of photos and words on your site, if you do some “street” be sure to let me know. Strong images Nate. You might just have stumbled onto a niche travel “blog” area as I’ve yet to come across anyone tapping into good street photography. Something which I think the world could see more of. Thanks Dave. Yep, I plan to do a series like this in every city I visit. I love the energy in the photos, you’ve inspired me to do a bit more street photography. Thanks Ayngelina, I’m feeling a little Déjà vu here ;) …you’re clearly a fan of street photography, I think you *should* do more, I for one would love to see it, as you have a great eye for an image. A really nice set of images there Nate. I love street photography but it’s something that I really struggle with. I find it hard to get up close and into people’s faces, and all the best street photographers like to get in and close. I’m also a sucker for black & white and I feel that black & white street photography is quite encompassing to the viewer. Good work mate….. Safe travels…. Cheers Jason. One thing to keep in mind, is street photography is *definitely* not all about getting up close and into people’s faces. That’s just one “style”, amongst many. If that doesn’t suit, no problem, you can take intriguing images of street scenes from further back. Yes, B&W certainly has it’s charms, I agree. Safe travels to you as well, glad you popped in for a chat! Thanks for sharing your tips! I would consider myself more as an iPhoneographer than a photographer but I can still apply it! I am still a bit shy at asking people and I know that I have to improve that. Your photos are good examples of good street photos even if, as you said, there are no rules. I love the black & white to show people’s emotions. What a fantastic article. I really enjoyed reading it and now I want to try it myself. I have always fancied taking candid shots but I always feel like i’m invading somebodies privacy but having read your article it has made me think that I should be more relaxed about it. You can offer any kind of advice you want and I will listen so long they will lead me to take amazing photos similar to the ones you’ve posted above. Your images are testament to your talent in this genre regardless of what it’s labeled. Really great tips for an aspiring street photographer, thanks! 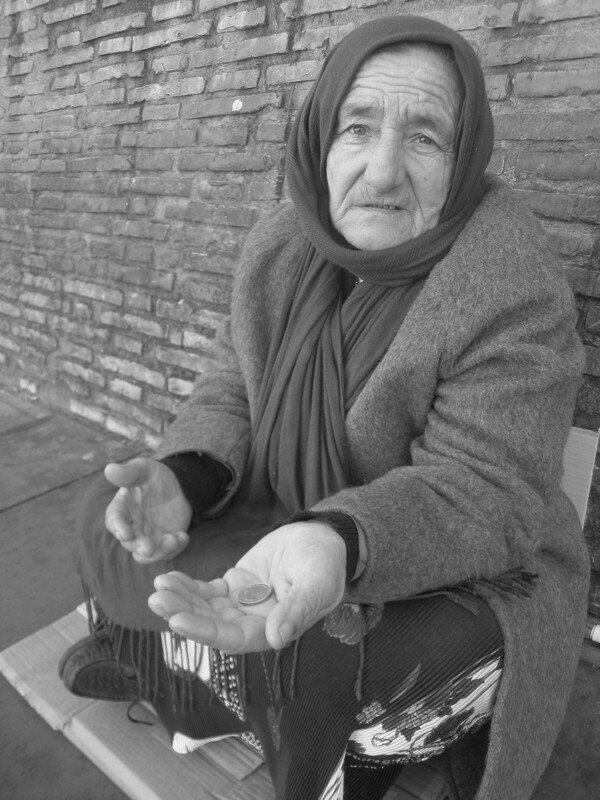 One of the most powerful photos I’ve ever taken was of a beggar woman in Rome. Even after asking her permission to take a photo, I felt like I stole something from her by taking the picture. That feeling still lingers. Thanks for sharing Steven. I know what you mean – I find it not in my nature to take photos of homeless/people begging, and similar subjects. I think everyone needs to make their own judgement on this, and I don’t find it surprising that the feeling of having stolen something is still lingering with you. We often learn more about ourselves, than our subjects, when out taking photos on the streets. Really LIKE the photo’s. What is a city, a street without the people? Each person in the photo has a story, that makes it so fascinating. Even later, I think, what would this person be doing now? What happened after that picture was taken? Beautifully clicked shots. And what an useful post, this will surely help me to get my photos right. Thanks for a really interesting post, the tips have certainly inspired me to go out there and try some street photography in my home town, The area is not all that interesting but it has a vibrant feel to it because of the people and their interactions with the environment they are in. although it is difficult to get over the selfconcious feeling when pointing a camera at strangers, i suppose its best just to get out there and do it! Some great tips here, Nate! I’m not really confident in taking portraits of strangers yet, but it’s definitely something I want to try and do more of in the future. Cheers Amanda, and thanks for the link on your great website! I was happy to be included in your monthly round-up. Everything I’ve ever read about street photography seems to suggest that people don’t usually react by yelling at you for taking a photo of them. I usually can’t quite get past my fear that I will be that exception, and everyone I try to photograph will be really upset about it. Getting over self-conscious fear of photographing strangers: on my to-do list. Hi Sabrina, I can honestly say, I have never had anybody yell at me, in any country I have taken street photos. Even “upset” is too strong a term. Some people object, or question my motives, but after a quick chat, nobody has even asked me to delete a photo. Most people just want to know what I’m doing, and why. Get out there and try it, you’ll be surprised at the reactions you get! Great tips. I’m pretty new to dslr photography in general (only bought my first one last year when I started my food blog and since then I’ve only started to tackle food photography with the 50mm prime lens — which is supposed to also be good for portraits so hopefully I can start learning about that and get practicing! Love the series and really appreciate the intent, i.e. deliberately spending a 24 hour period trying to capture the feel of a place. I did this once very consciously when I was in New York for a few weeks. At the time I was into video and after spending some time getting a feel for the place I then spent a day wandering the streets trying to get the shots and angles that helped try and express what NYC meant to me. I posted it on a site I belonged to and got some amazing feedback from people who thought I had captured the true essence of the city. And then I haven’t done it since… silly me! Wow, this blog is written so differently to xxxxxxxxx. I’m really liking it though. Well done sir. Thanks Sam, appreciate it mate. Im glad to find this tips. As a begginer in street photography finding a new and unic object or story are one of my consideration. After reading this tips/ information many times I tried to click my camera more, anywhere I like in the street way. Natural, spontaneously, unrepeatable, it is what it is. Cheers Stefanus. I also spend some time searching for unique stories to tell on the streets. I’m glad you got out there, clicked, and shared the results. To me, that’s what it’s all about. PS, Budapest is an incredible location for any sort of photography! amazing pictures! every picture has a story! Thanks Abhinav. Hope you had some fun doing the street photography. I got over the nerves when I first started shooting images in the street by concentrating on shooting people from behind without them being aware. Passers by who saw what I was doing would engage with me or look at the subject which has made for some great shots. I soon got into taking more shots and then as my confidence built I began pointing the camera directly at folk who were walking past my original subject and shooting them too! A lot of them were aware of what I was doing but didn’t mind in the slightest. Others seemed to really enjoy the fact that they had just been snapped. A cheeky grin on my part and in some cases showing the subject the shot and sending it to them by email if they really liked it has worked wonders. Never had to offer to delete a shot of an irate subject but I would if they were genuinely unhappy about it. Well, maybe!! Thanks for sharing your technique, Matty. I also find that a cheeky grin, and an offer to show the subject the photo, goes a long way. It’s something I find myself doing quite often. If you have any of your street photography shots online, feel free to share them! I have enjoyed your pages and insights, I must admit I do not have the courage for overt street photography yet, especially in western countries. In Asia and the Middle East as you pointed out in your Iran spread people are quite happy to have the pic taken and always curious. I traveled through Turkey, Syria and Lebanon in 2007 and regard these places and real highlights in my traveling life. I think alot of the western countries have now become a place of fear. I remember being threatened by a security officer after taking a picture of a Jewish building near Columbia uni in NYC, she wanted me to delete the photo or she would call the NYPD, I didn’t and kept on walking. I’m extremely conscious of taking pics of children in any social situation, although I have witnessed some fantastic moments. Asia and less traveled countries are much more relaxed, it a shame some sick individuals ruin the real art of photography. Good luck in your journey, appreciate the tips and stories and look forward to more! Neil, I agree. Western countries have become very fearful. It’s one reason I enjoy travelling through Asia, the Middle East, and Eastern Europe – people are much more relaxed about photography. The less travelled, the better!